Amazing really. 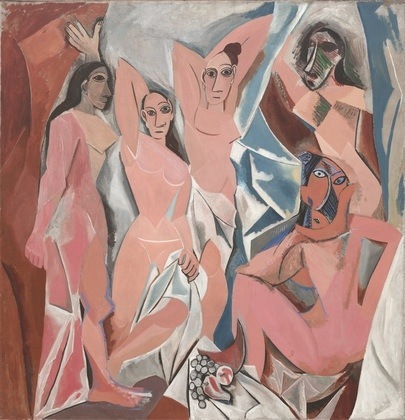 And of course he changed the face of modern art with his famous “Les Demoiselles d’Avignon” (The Young Ladies of Avignon, and originally titled The Brothel of Avignon)”. A painting from 1907 full of African Art replacing faces, an image both magical and terrifying to his contemporary audience (oh and this was a montage of African Art and prostitutes). The piece caused a perfect rucus and propelled artists and audiences to shift their perspective. Important to note, that much like our current focus leaves much to be desired, thank you internet, Picasso’s admiration and focus on African Art was quickly diminished as he moved on to other strands of work. Later, when asked about African Art, Picasso said “African Art? Never heard of it!”. It’s safe to say we are not terrified or repulsed by the work now, only find it a mythical painting from an art historical perspective. Whether they describe it as such, many contemporary artists still work with art as a mediator between worlds – even Rauschenburg describes the work he did focuses on the “gap” between life and art, with an emphasis on art object equaling everyday objects where demystification of one, made mystical the other. But will we ever regain that naiveté in terms of seeing something for the first time – like Picasso seeing African Art? He was so moved by these forms, these art objects from another place all together. We can see it all from the comfort of our computers without a blink, and often share the reverence of a coffee cup or roll of toilet paper with illuminated manuscripts. I’m guessing that the magical powers of art has transferred to magical powers of movement: swimming in different oceans, looking into new eyes, and sitting in other climates. Movement and less art object becomes the magical mediator and changing our context versus the context of things around us will continually inspire us to make tools to navigate the harsh and exciting realities of our worlds today. Tools that we call art, sacred and magical art.